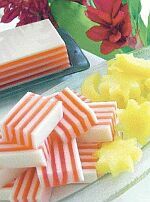 Combine all the ingredients for the red jelly in a pan and gently bring mixture up to the boil. Once boiled, cook over medium for 5 minutes until agar-agar is completely dissolved. Tint the jelly red with a few drops of colouring. Set aside. In another pan, combine everything except the coconut milk for the white layer. Gently bring mixture to the boil and then simmer for 5 – 7 minutes for until agar-agar is completely dissolved. Add the coconut milk, allow the mixture to boil once more and then take the pan off the heat. To assemble the jelly, locate a 15 cm x 15 cm square tin or glass dish or a round dish/tin approximately 18 cm across. Starting with the white, pour in 150 ml of jelly (measure out in a measuring cup) and allow it to set. Next pour in an equal quantity of red jelly, allow it to set and then alternate with the white. Continue alternating the colours until both jellies are used up. Chill well before cutting into slices.